In the video I explain the features of the system step by step in a straightforward manner while demonstrating the effects. Take a look at how semi-procedural animation can dramatically improve the realism of animated humans and animals. Move your character around by any means you desire, be it a CharacterController, a RigidBody, or your own custom movement logic. The Locomotion System simply observes the position, alignment, velocity and rotational velocity of your character and deduces everything from that, along with some raycasts onto the ground. The Locomotion System automatically blends your keyframed or motion-captured walk and run cycles and then adjusts the movements of the bones in the legs to ensure that the feet step correctly on the ground. The system can adjust animations made for a specific speed and direction on a plain surface to any speed, direction, and curvature, on any surface, including arbitrary steps and slopes. 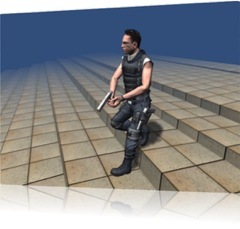 The Locomotion System is available for free commercial and non-commercial use when used in a Unity game. The full license is included in the package. The Locomotion System is developed by Rune Skovbo Johansen in collaboration with Unity Technologies. The presentation of the Locomotion System at Unite 2008 was received very well judging from the number of times the audience burst spontaneously into applause, and this Gamasutra article refers to the presentation as a "crowd favorite". I'll let you know when the video of the presentation is online. If you are a Unity user and have any technical questions regarding the Locomotion System, please ask them on the Unity forums so more people can benefit from the questions and answers (and maybe notify me by email of your forum post if you want to be sure I see it quickly). This session will present the free Locomotion System developed by Rune. The session will discuss how to let the system solve the complex tasks of blending multiple walk and run cycles and perform dynamic foot placement on uneven terrain while keeping animators and game programmers firmly in control of style and behavior. See the Unite 2008 conference info and agenda. The Locomotion System that I'm developing is for the Unity game engine, and Unite is the yearly Unity developer conference packed with presentations, technical sessions and special events. I've made a video with voice-over demonstrating the capabilities of the Locomotion System I'm developing. The video is based on one of the interactive demos in the previous post. Lots of demos you can try this time - yay! Tip: For better performance, unload one demo before you view the next. Climb the crates and boards. Use shift to run; default is walking. Note that this demo only uses one animation for walking and one for running. I have worked hard on finding a way of making the Locomotion System easy to integrate with an existing animation framework in a game while keeping it flexible. I have now implemented a feature where animations used by the Locomotion System are grouped together in animation groups. For example, animations for walking and running in different directions could be put in a single animation group. The group as a whole can be controlled manually the same way as regular animations are controlled in Unity, while the blending of the individual animations in a group are automatically controlled by the Locomotion System. Furthermore, the system supports using multiple animation groups, so e.g. one group can be used for normal walking and running (in all directions), and another group for sneaking (in all directions). When the character jumps, an animation is cross-faded in that is not controlled by the Locomotion System. This way the feet do not attempt to stay on the ground while the character is jumping. When the character is standing still for a little while, an "waiting" animation is cross-faded in. Since this animation is also controlled by the Locomotion System, the feet stay properly grounded. As a part of my thesis, I want to test the usability of the system. If you are a Unity user and would like to try out the system and help me by evaluating it, please let me know! The Locomotion System is by no means finished yet, but it is now almost at a stage where it is ready for preliminary testing. When people see the Locomotion System in action, they sometimes get incorrect ideas about what the system can and cannot. Here is a brief description that can hopefully make things a bit more clear. The Locomotion System for Unity automatically blends your keyframed or motion-captured walk and run cycles and then adjusts the movements of the bones in the legs to ensure that the feet step correctly on the ground. The system can adjust animations made for a specific speed and direction on a plain surface to any speed, direction, and curvature, on any surface, including arbitrary steps and slopes. The Locomotion System does not enforce any high level control scheme but rather lets you move your character around by any means you desire. The Locomotion System silently observes the position, alignment, velocity and rotational velocity of your character and deduces everything from that, along with some raycasts onto the ground. This flexibility means that you can use a CharacterController, a RigidBody (those are standard components in Unity) or something else entirely to move your character around in the world, exactly as you would normally do. A physics-based system or active animated ragdoll system. The system has no integration with the physics simulation. It is purely kinematic, though it does base the kinematics on some raycasts onto the geometry of the ground. The system cannot make the character react instinctively to external forces such as being punched, tripping and falling, or being shot. The system only blends and slightly adjusts your existing animations. A unified system that can be used for all animation of a character. I just finished the first presentable demo. It is just one character with a fixed animation for now, and the foot step placement doesn't yet attempt to avoid intersecting geometry, but as an appetizer of what is to come, it will do. Click the image below to view the demo. The system maintains the original ankle local rotation while the foot is in the air, and only enforces a re-alignment of the foot while it is on the ground. While landing on the ground and while leaving the ground, a blending between these two modes of operation is used. The system keeps track on when to use the heel and when to use the toe as the point of reference relative to the ground. This is based on which one is closer to the ground at any given point in time. Support for walking on sloped surfaces. More sophisticated step length / step frequency mechanism. More intelligent foot placement mechanism that avoids ledges. Anyway, I'm glad to finally have something to show, even if it isn't much for now. Comments are much appreciated! Creating a system for adaptive animation for character locomotion in computer games is not only a very exciting master thesis project, it is also my opportunity to work with an idea I have had for a long time. Back in 2001, when I was 18, I made rendered 3D animations in my spare time with the freeware raytracer POV-Ray. POV-Ray doesn't have a graphical front-end like 3Ds Max etc; instead you make your images and animations with a scripting language. Making the system was a rather big challenge. POV-Ray has no support for keyframe animation so I had to make all animation 100% procedural and animate it by scripting! This was a very slow process and I never got as far with the system as I had in mind. Now, using the Unity game engine, I am creating a walking system again. This one is different. In the system for POV-Ray (that was made for offline rendering) every step was calculated in advance. With the new system, characters need to respond dynamically from input from the player or from AI. Also, this time I have keyframe animation, skeletal animation, animation blending, and many other features at my disposal, which makes it easier to do more advanced things, but which also bring new challenges. Although the new walking system for Unity will be very different from the old walking system for POV-Ray, I still think the video here will help make it easier to grasp what the system will be all about. Lift time: When the foot begins to lift from the ground. Liftoff time: When the foot lifts off completely from the ground. Strike time: When the foot first touches the ground again. Landing time: When the foot has fully landed on the ground. These times can be seen in the bottom graph in the interactive analysis visualization here. Click to activate it. Note that the graphs refer to the ankle and toe of each foot. What they really measure is the ankle and foot positions projected onto the ground at the stance pose, i.e. points on the underside of the foot. Since these projected positions are approximately at the heel and toe, I will be referring to heel and toe positions below. Automatically finding the foot lifting and landing times can be tricky, especially if the animations that are being analyzed are not of the highest quality. 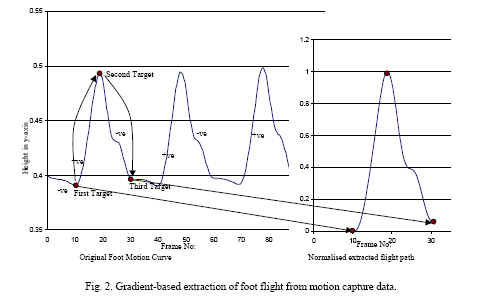 Our approach for retrieving the flight path from the motion capture data is based primarily on a gradient analysis technique where, over the course of the original motion, we analyze the height value of one of the character’s feet. The first target we look for is a switch from a negative to a positive gradient on a frame that is within 10% of the global minimum height for the foot. This gives us the start of the foot flight where the foot is just about to leave the ground. From the first target, we progress along the original flight path until we meet a second gradient change from positive to negative, which is on a frame whose height value is within 10% of the global maximum. This second target is the peak of our flight height. Continuing along the original path, we locate the third and final target via one last gradient switch from negative to positive, whose frame height is again within 10% of the global minimum. This technique is demonstrated pictorially in Figure 2. I have been inspired by this technique by Meredith and Maddock. However, in my own tests I have found their procedure insufficient to properly handle the very varied animations I have used as test cases for my system. In my test animations, the feet don't always actually lift up from the ground when the legs starts to swing forward, but rather sort of drags along the ground. Also, the feet sometimes intersect with the ground, which also makes the analysis non-trivial. In order to make the analysis error-tolerant in these kinds of scenarios, I have used several rules in combination to find the foot lifting and landing times. Start following the Y movement curve from the stance time and forward (/backwards) until the height curve reaches 10% of the maximum height of the curve. The lifting (/landing) must come before this point. Inside this span of the curve, find the point with the maximum curvature (the maximum second derived of the curve, i.e. the most sudden rise in the curve). Disregard points on the curve that are below the ground level. Disregard points on the curve where the first derived (i.e. the slope) is below zero (or above zero when searching backwards). These rules combined will almost surely find the point on the curve that intuitively looks like the point where the curve starts to rise from the ground. However, another check has to be made. This check is made for the foot Z movement curve (i.e. the swinging back and forth of the foot). Start following the Z movement curve from the stance time and forward (/backwards) untill the slope is more than 50% different than the slope at the stance time. Since the speed at the stance time is the point of reference for the ground, a speed that deviates more than 50% must mean that the foot is no longer following the ground, and thus no longer standing on the ground. If this time occur before the lifting time (/landing time) found by the other rules, then this time is used as the lifting time (/landing time) instead. The 50% value here has been chosen by trial and error from the test animations. For a completely accurately animated character, the feet should be moving with a completely constant speed while they are on the ground since the ground is moving backwards with a constant speed relative to the character. However, this is not always the case in actual keyframed animations, and the speeds of the feet can be quite inconsistent. Thus a large tolerance value has to be used. The next step is to use the motion analysis data to synthesize adaptive walking and running animations. Using the lifting and landing times, the foot flight paths and the analyzed speed of each animation, new paths for each foot can be generated in accordance with the environment and variable movement of the character. There are three graphs shown in the view. The bottom graph show the vertical movements of the ankle (red curve) and toe (green curve). The middle graph show the horizontal movements of the ankle (red curve) and toe (green curve). It also shows a black curve that is a weighted average between the ankle and toe curves. The top graph shows the balance of importance between the ankle and the toe, based on which is closer to the ground. This curve is used as the weighing factor for the black cuve in the middle graph. Also, the analysis finds a "stance time" for each foot. This is the time when the foot is most firmly standing on the ground. The graphs are shown such that the stance time is always at the left side of the graph for all feet. This way, is is easy to compare the curves of the different legs and the different animations. The stance time of a foot is determined by finding the point in time when the ankle height and toe height are as low as possible. It is important that they are both low, so rather than using the average of ankle and toe height, the maximum of the two is used. By sampling the horisontal movement of the foot at points in time around the stance time, the overall speed that the character is moving with can be concluded. It is important to determine the movement of the foot from the part of the foot that is currently closer to the ground, thus the black curve from the middle graph is used. Using just the ankle movement or just the toe movement would give incorrect results. The character must be aligned with Y = up and Z = forward. The animation must contain only one cycle, i.e. one step with each foot. For that reason, skipping is currently not supported. There doesn't have to be any symmetry in the steps though, so e.g. a gallopping horse should work fine. Currently the analysis method has been tested with a soldier character with a walk cycle and two run cycles as well as a robot character with a run cycle. I would like to test the system with many more characters and animations, including creatures with more than two legs, so I am currently looking into ways to get more material to test with. The goal is to create a robust analysis that can correctly interpret most animations that are thrown at it. I have just begun working on my Master Thesis, which I will be making in collaboration with the company Unity Technologies that make the awesome Unity game engine. The Master thesis will be about "Adaptive Animation for Character Locomotion", which basically means creating a system for adapting walking, running, and crawling keyframed animations to a dynamic environment. The system will take curved paths, uneven terrain, and variable speed into account all the while ensuring graceful footsteps without slipping feet and motions that stay as faithful as possible to the original keyframed animations under the given restraints. Inverse kinematics is one of many techniques that will be involved in this. The system is meant to be generic in nature, working not just for biped characters (with two legs) but also for example for dogs, bugs, and spiders and, say, robots and aliens, provided that they move around using a limited number of legs. This list of features is the ideal case - time will tell how far I get within the timeframe of my Master Thesis. Hopefully I can continue working on the project after my graduation, if necessary. In the end, the result of my work will be made available to all users of Unity free of charge, for any use. I hope to get people from the Unity user community involved in testing the system as it is developed, since one important success criteria is the usefulness and usability as perceived by the developers using the system. It will take some time before the first prototype is ready though, as I've only just begun. A few ideas have already changed since that. For one thing, the idea that animators must enrich the animation cycles with additional data has been abandoned. The data needed is for example information about when exactly each foot leaves the ground and land on the ground again. The new plan is that this will be automatically analyzed and calculated by the system. More on that in a later post. Click the image to make the demo run in the browser. Just click yes to install the Unity browser plug-in. Note that in this simple demo I simply adjusted the altitudes of the feet, so feet slippage etc. are not prevented. The actual system will work in a completely different way. I have already gotten some interest and positive feedback in the Unity forums. Stay tuned! My website runevision.com has been online since 1998. Now, ten years later, runevision blog is started to make it simpler for me to communicate developments in ongoing projects and other things in my life. For a start, the blog will mainly be centered around my master thesis project on Adaptive Animation for Character Locomotion, which I have just begun working on. For the next half a year, this blog will be a place for myself and others to track the progress of the project, see the ongoing results, read about the thoughts behind the technical details, and roll eyes at the occasional silly remarks. Website makeover! Finally, rune|vision has gotten a completely new design. The six years old dark and blue angled design has been replaced with a bright smooth lime and orange design, aimed to make it look more professional, and the content has been revised as well. Hope you like it! I've also uploaded my 3D image series Metal & Flowers, which is my most ambitious artwork yet, and an exercise in playful ironic contrasts, both visually and thematically.